If you’re interested in the use of computers and networks to support collaboration, you’ll have heard of PLATO. It was an early courseware system, and by early I mean circa 1960, running on vacuum tubes. But it was also a petri dish in which much of what we now know as online culture first evolved. it challenges our assumptions of how the online world evolved. It rewrites the history. It’s as if we discovered Wilbur and Orville Wright were not the first to fly a powered plane — that it’d been done faster and longer with a jet aircraft 30 years earlier. Of couse the same can be said of other early technologies, notably Smalltalk, which introduced ideas and methods that are only now hitting the mainstream. It’s fun to wax nostalgic, but I’d rather explore how these systems arose, why they flourished, and what accounts for the propagation of their memes but not their genes. From that perspective Brian reminds us, first, that PLATO was expensive. Few universities were willing or able to invest millions in a Control Data mainframe and a fleet of gas-plasma flat-panel bitmapped touch-screen display terminals. Those terminals enabled some extraordinary things, like the interactive music software that captivated Brian as a University of Delaware undergrad. They also enabled a now-extinct species of emoticons, which relied on the bitmapped graphics. But since much of what became PLATO’s essential DNA required only character-mapped graphics, those expensive bitmapped screens became an evolutionary bottleneck. Another feature that didn’t pass through that bottleneck was PLATO’s ability to make sense of natural language input. Many thousands of programmer hours were invested in enabling PLATO to recognize a variety of human utterances. That in turn enabled courseware authors to create lessons that responded intelligently — and, Brian says, in ways that are sadly still not typical of modern courseware. Today we can attack that problem by creating open source libraries, by reusing them, and by extending them. That’s a great way to create DNA that can propagate. But it’s useful to consider why it might not. We still, for the most part, create dependencies on specific programming languages, and on the environments in which they run. 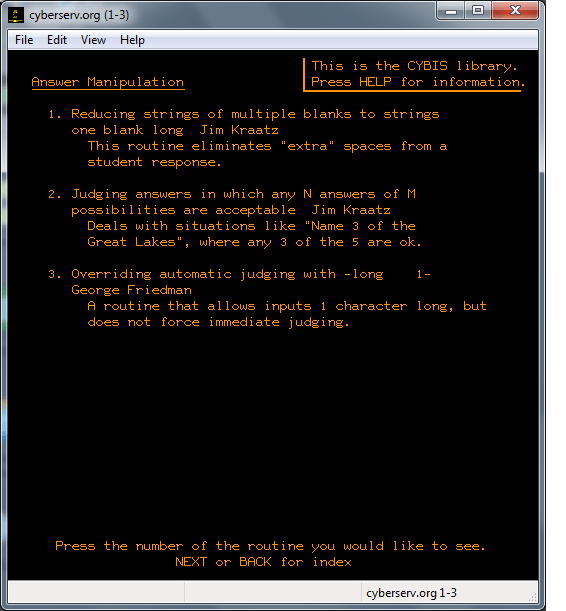 This is a screenshot from the live PLATO system running (in emulation) at cyber1.org. It’s a page from the catalog of functions in PLATO’s CYBIS library. Shown here are some of the methods available to process responses to questions. Some of those methods might still be useful. And if they’d been packaged in a language- and system-independent way, some might conceivably still be in use. PLATO programmers didn’t have the option to package their work in a such a way. Now we’re on the cusp of an era in which these kinds of library services can also be language- and system-independent web services. Will we exploit this new possibility? Will some of today’s core services still be delivering value decades from now, freeing developers to add value farther up the stack? It’s worth pondering. Nice…I didn’t know PLATO went back to the vacuum tube era. You didn’t mention one of the more striking applications that took decades to reproduce on the more distributed technology of the Internet — multiplayer games. A small correction (I think) — for PLATO IV at least, there was only one CDC mainframe at UIUC; other universities running the system had terminals connected by dedicated lines. Running an additional mainframe was not a cost (or an option). Well, it sounds like the original source hasn’t been lost. I don’t suppose VCampus feels like giving it away…. As a programmer and project manager at NovaNET Systems in late 1990s (NovaNET was the commercial spin-off of CERL’s PLATO system at University of Illinois), I always felt the resources, ideas, and technology of PLATO has never been fully appreciated . Thanks again for the blog post.